I 1st did some marking and got a hole drilled into the Copper plate / Tamhan to fit the SO-239 / PL-259connector. I drilled those extra holes at the edge to fix a L clamp for mounting the antenna. 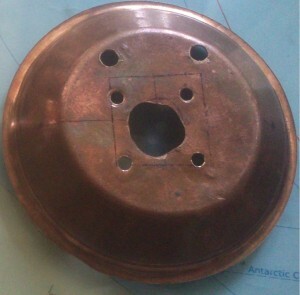 Holes drilled into the plate for fixing the connector. Then we calculated the length using formula 234 / 144 Mhz = 1.63 feet. So we decided to keep the core element 1.63 feet and 4 radials 5% extra of center element at 1.71 feet. I then cut the radials and main element as per the sizes calculated. 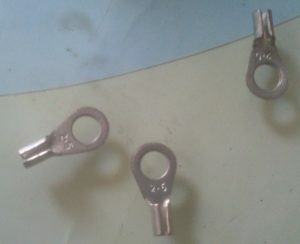 The main element doesnt feet into the SO-239 connector directly as the whole is just around 1.5 mm wide and the rod is 3mm in diameter. 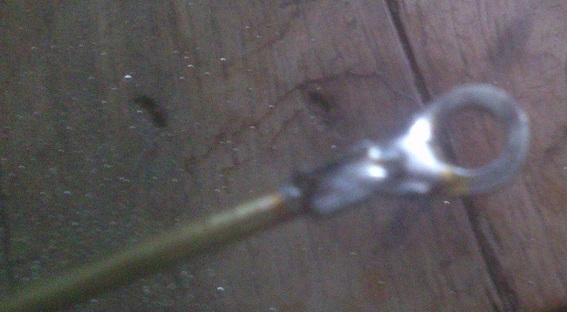 So, some filing at one end of the main element rod was needed. Once the main element was filled we quickly soldered it to the So-239 connector. 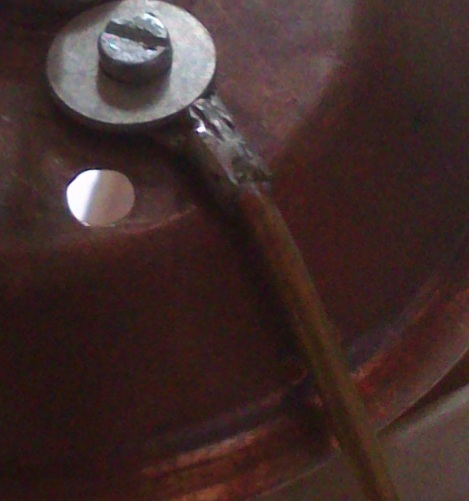 I was 1st supposed to bend the edges of the rod to a circle and fix them to the plate. Joshi kaka offered some lugs he had spare to fix the radials. Lugs were also soldered to the 4 radial rods. 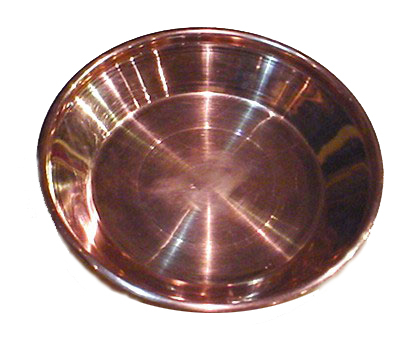 As 25 watt iron was not helping, Joshikaka suggested we use 50 watt Iron and that did the trick. This is how it looked. Center/main element along with the SO-239 was fixed to the plate. Radials along with the lugs at one end were bent at around 45 degrees and fixed to the copper plate with screws and washers. We couldn’t find Stainless steel screws so we settled on what we had. Its advisable to use SS steel as this is antenna is going to be sitting outside the building facing some rough weather. 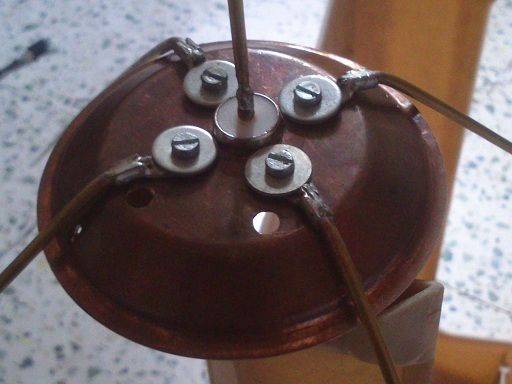 This is how the antenna looked after fixing the main element and the radials. All radials and the main element fixed. Tied the radials to the edge of the plate through 2 holes with copper wire. Soldered the radials at back of the plate with copper wire. 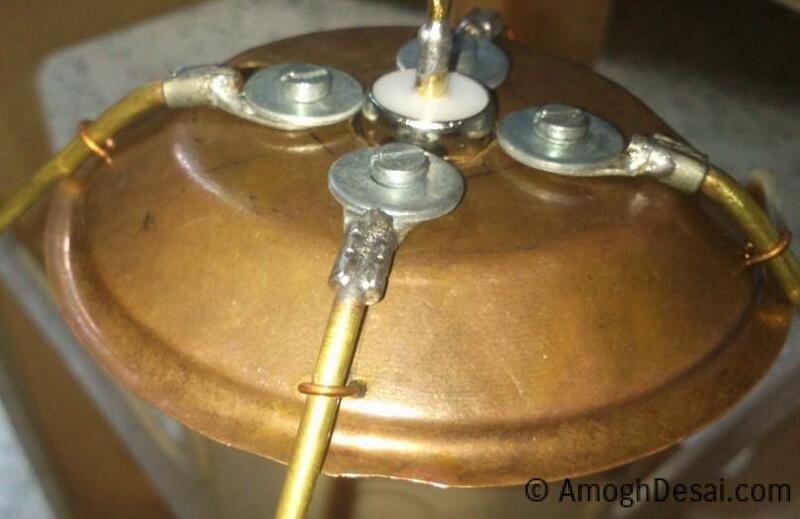 With this our Ground plane antenna for VHF Ham Bands was ready. Antenna ready and all set to be tested. 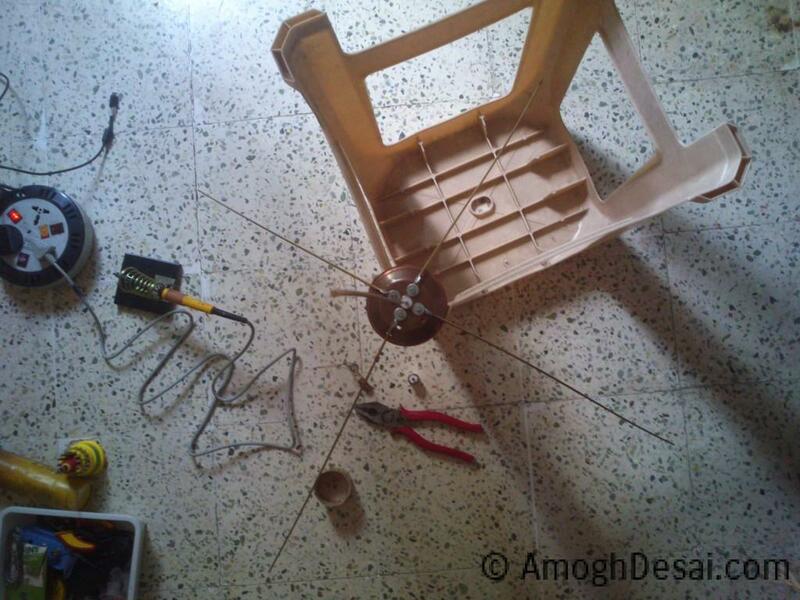 It was now time for some testing, I had Joshi kaka to test the antenna with his antenna analyzer. Though we made it for the HAM bands, it was resonant at 139 Mhz with the current length of its elements. Calculated SWR, 1:1 at 139.62 Mhz. 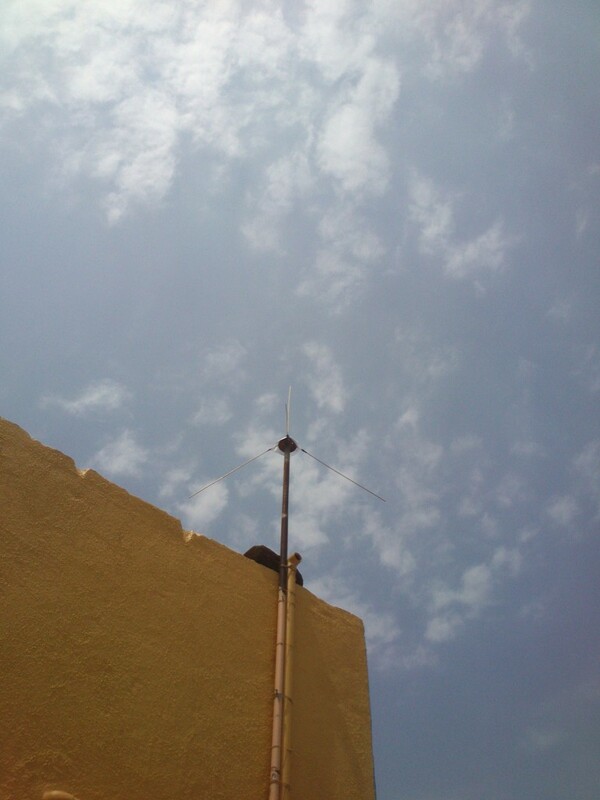 We decided to keep the Antenna at that, as I don’t have a license and I am not going to use it for transmitting. My motive was to build it and use it with the RTL SDR dongle for receiving NOAA satellite images (weather fax). That is what brought me to this hobby in the 1st place. at a resonant frequency of around 140 Mhz we decided to leave it at that as I can use it for trying out my hands on weather satellite at 137 Mhz as well as listen to the daily VHF net between Pune and Mumbai Hams at 145.500 Mhz. 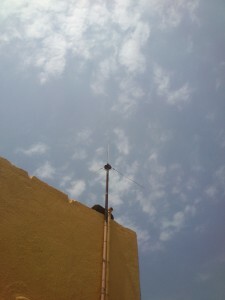 With the antenna all set and ready, I reached my QTH and fixed the antenna at the topmost point of my building. I used a SS pipe used for electricians to mount the antenna. 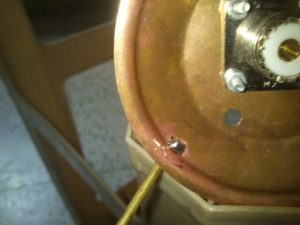 I did not clamp the antenna, but just passed the cable (RG-58 cable) through the pipe, with SO-239 connector as a stopper at the top. With the weight of the cable, the antenna just stands on the pipe, sturdy with no other support. That was another suggestion from VU2ASH which helped. Antenna Mounted and ready for use. With the antenna mounted I could now get some AIR traffic and the VHF net. I am now looking to get some weather satellite images with this antenna clubbed to my RTL dongle, as that was the motive behind building this antenna. As of today, I am not a licensed HAM. I am still awaiting my exam since I applied for it in April 2012 through the C0E Pune ( 🙂 you know the government). I am always fascinated by HAM radio and technologies used in this field. The first time I heard about HAM radio back in 2004, I first Googled to find a HAM back in Goa, my native place. I met OM Manju (VU2SMS) who was eager to get me into the Hobby. What got me grooving to want to be a HAM was not related to HAM radio directly, but was a NOAA weather sattellite transmission he showed me back than. He had a Ground Plane antenna for VHF HAM band and we just managed to a get a good APT transmission captured on his PC. The picture got me so amused and I was quickly hooked to this hobby. With time I learned that the fun was endless. Never applied for a license and long way since then, got through the education and job and so on. I am back to this hobby and 1st thing I built (successfully I mean) was the same VHF Ground Plane antenna we used to get a NOAA signal, which really got me into this hobby! 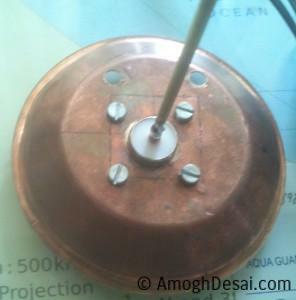 If you like this antenna I built, I would love to read you feedback or if you have some suggestion just leave your comments below. I faced one issue on this page . when I opened any Photo ,Mouse or scroll wheel still controlled Page at background and not the image . so I could not get clear look at or zoom photographs. I am not sure whether problem is with website or my system/browser. Hi very informative…can i contact you? this is no short of brilliance. I have been wanting to find someone in Pune who could guide me on how to create a HAM radio. There used to be multiple groups but they have been lately redundant. Can you please help me on the basics and “how to” of HAM. Any guidance would be much much appreciated. Hi Samvit, great to hear you wish to join the HAM fraternity. Please check your mail for more details. Would you pl guide me in understanding how to Ham and becoming/joining “Ham fraternity “? I am based in panjim. Hello Vaibhav, glad to know about your interest. I shall contact you over email. This is arjun from Pune. I would like to know that what receiver you are using for hearing 2 Meter VHF band. I am planning to home brew VHF ground plane antenna at my side too. I am confused between ground plane or half wave dipole to brew. Btw I am also in Pune and have dropped an email to you. I confuse whether to make outdoor ground plane,dipole or simply Attached telescopic antenna for RTL SDR. 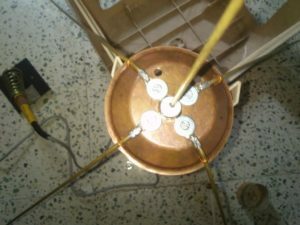 I also tried homebrew active dipole antenna(mar8 )mmic,got overloading and oscillations. Please suggest better option ,antenna could be compact and could be hidden. 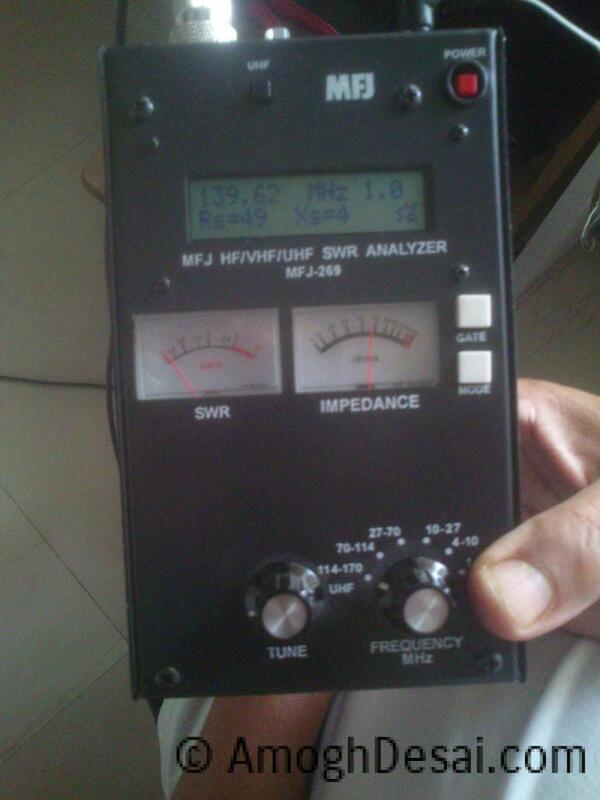 HAM Network in Pune is very active and lots of ragchewing happens on HF and VHF. VU2PNE is long dead. However PHARC (Pune Hams and Amateur radio Club) has setup a new repeater VU2PHA which you can access and make QSOs in Pune. I too own a Baofeng handy and use it regularly with this ground plane antenna to make contacts everyday with active Pune HAMs like VU2ASH, VU2UPQ, VU2LOC, VU3MXE, VU3JFG and many more. Get your handy soon and see on air!